If a Standard Wheelchair fits your needs, look to Quickie and get the most out of every moment with the freedom of moving around safely. With Quickie Standard Everday Wheelchairs, you can keep focused on your life, your loved ones, and yourself while Quickie focuses on your mobility. Made of high-strength steel, Quickie Standard Everyday Wheelchairs offer the flexibility to accommodate a variety of users. 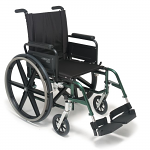 Sportaid offers an impressive collection of Standard Everyday Wheelchairs from Quickie. Opting for the Quickie Breezy Ultra 4 Wheelchair or M6 Folding Wheelchair alike lets you rest assured that you’ve chosen a wheelchair that is ideal for frequent or everyday use. The quickie standard wheelchairs are easy to store and easy to maneuver. The features like high-strength, lightweight frame, reclining back, padded desk arms, swing-away footrests, padded full arms, elevating legrests etc. make for a reliable performance and long life. Discover a smoother and more effective ride by browsing through our huge selection of Quickie Standard Everyday Wheelchairs or feel free to call 1-800-743-7203 for help purchasing your wheelchair today. You'll be glad you did! Savings as high as 69% make Sportaid the premier retailer for Quickie Standard Everyday Wheelchairs! Satisfaction is guaranteed whether you are shopping Sportaid for the first time or you were among our first customers 25 years ago. With exerience ranging over the past 25 years in the business helping people find Quickie Standard Everyday Wheelchairs at the lowest prices, Sportaid remains an industry leader in control of a massive selection of wheelchair cushions, wheelchair parts, and wheelchair accessories. We are capable of beating any competitor's advertised price, just call! Our customer service staff has over 50 years of experience, plus over 90 years of combined wheelchair use experience. We look forward to working with you!